After a couple winter months spent primarily in the office, travels resumed once again this month. 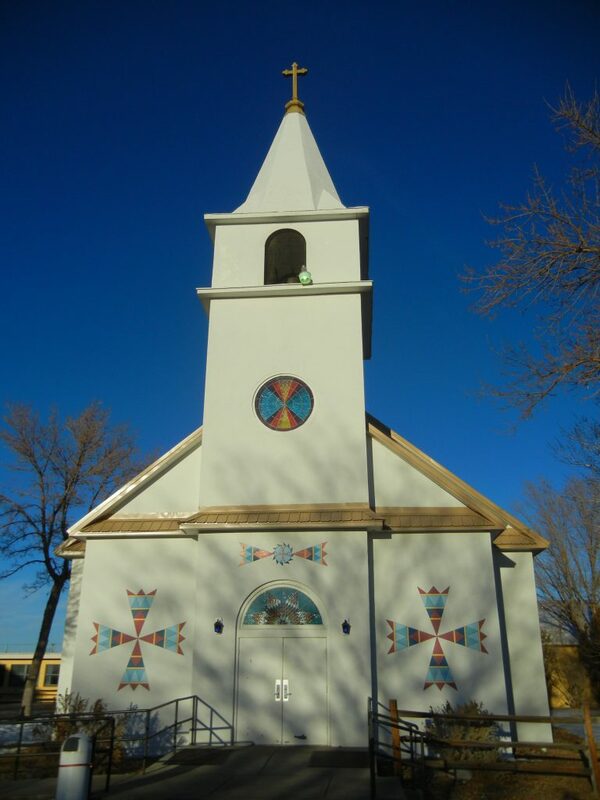 In the past two weeks, I’ve celebrated Mass or visited to following: Blessed Sacrament in Ft. Washaki, St. Joseph in Ethete, St. Stephen’s, Lander for a brief visit with some of the faculty at the Wyoming Catholic College, St. Margaret in Riverton, St. Francis in Thermopolis, St. Mary Magdalene in Worland, Our Lady of Fatima in Casper as well as the Cathedral and Holy Trinity in Cheyenne. Today I’m enjoying a bone fide day off. 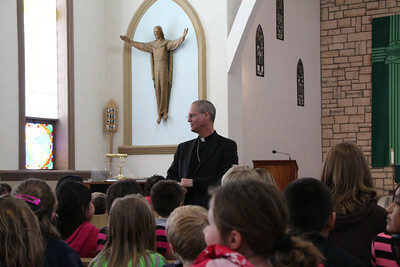 I truly enjoy the opportunity to be with the people in the diocese. It reminds me of the way Jesus himself ministered through his travels from town to town, one person at a time. These recent trips provided an opportunity to simply be with the people that wished to come for Mass, dinner and a visit. Matt Potter and I have been ‘drumming up business’ in relationship to our annual Living and Giving in Christ appeal. This allows me to make a stronger connection with parishioners on a personal basis and gives us the opening to help them see that the parish as vital as it is in our ministry as a church is connected to a larger, universal Church. We are also able to educate around the need for the appeal regarding the ministries it supports as well as make a strong argument for the spiritual theology of stewardship and the many ways we are asked to make a generous return to the Lord for all he has done for us. Not all of the visits revolved around the Living and Giving in Christ theme. While I was in the area, I simply ‘popped in’ on some of the faculty and staff at the Wyoming Catholic College. It is good for them as well to know of the bishop’s presence and support for their good work. The visit to Our Lady of Fatima was an official Pastoral Visitation. In the Fall, I began making such visitations in order to look a bit deeper at the workings of our parishes. I get an extended time to visit with the priests, deacons and pastoral staff about their work and to hear from them about their challenges and concerns. There is also time for visiting with the Finance Council, Parish Pastoral Council and Parish Trustees. Of course, there is also the great joy of celebrating the weekend Masses and the gatherings that follow. Fr. Fox and the folks at Fatima are doing a great job! Of course, there were the moments of being ‘back in the office.’ The correspondence, meetings and staying in touch with my own staff never ends. I and the people of this diocese are truly blessed by a great chancery staff. I do not have to worry while I am on the road about business continuing as usual back in the office. We have tremendously dedicated and talented people serving us! 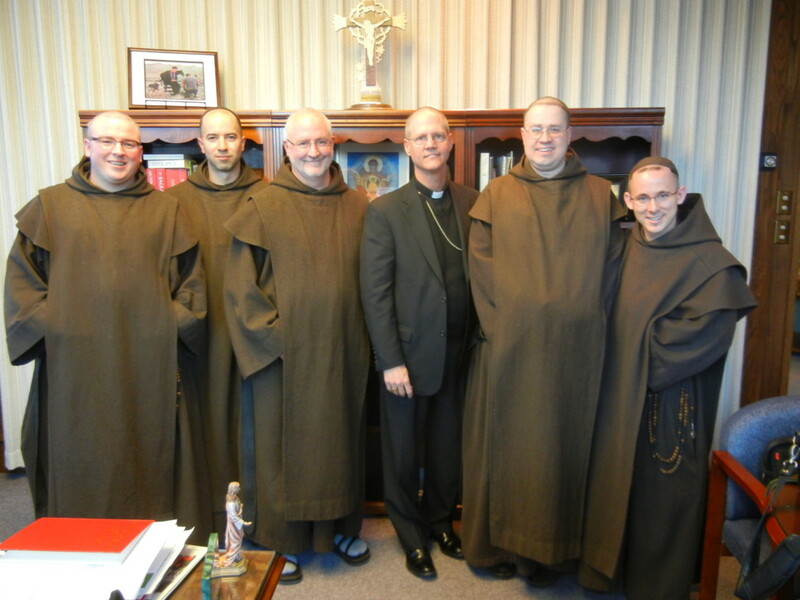 Yesterday, we had a rare visit from our cloistered Carmelite monks. As we had some timely business to discuss, and I was unable to get to their location, I invited their Chapter members to come to Cheyenne. I’m pleased to report that our Carmelite monks are making great progress along with their Foundation Board in fundraising for their new monastery. Their building plans are nearing a final draft, after several years of creative effort. Also, we are very near approval of the latest revisions of their constitutions, which is the canonical document that defines their charism, way of life, and governance. As this readership already knows, I have a great love for our Carmelite monks, and always enjoy my time spent visiting with them. Please pray for them as their planning progresses closer and closer to seeing their dreams realized of finally living on their new mountain property! Blessings to all in your Lenten journey. Draw close to Christ, and allow the light of his face to shine upon you. Trust always in his guidance and love.